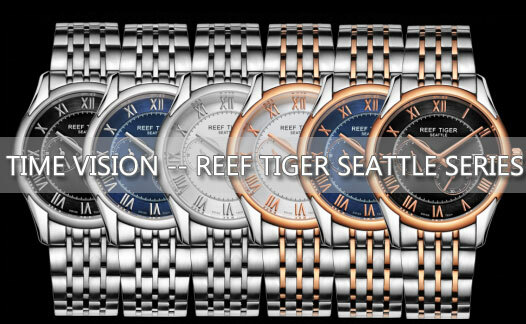 Time Vision is one of three brands of the Seattle series of Reef Tiger, it’s endowed with abundant cultural connotation of the city Seattle, representing our good detainment of time. The hands of Time Vision are sword shaped, which echoes with the Rome hour markers. Small seconds subdial is set at 4 o’clock, the 24-hour display is positioned on subdial at 9 o’clock, this design is more suitable for business needs. Rome hour markers display the time, fitting the romantic theme of Seattle, statedly and elegant. 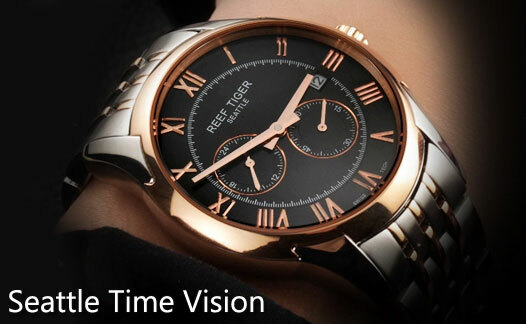 Each Rome hour marker of Time Vision has 12 cutting face, which ensures the third dimension and shine of hour markers, this is also the perfect reflection of Reef Tiger’s exquisite technology. The middle part of the sword-type hands is raised, sides are brushed, wedge-shaped hands make the whole watch more vivid and three-dimensional, before assembling, each hand set of Reef Tiger adopts vacuum packing, to ensure each second hand is flawless. Even the tiny watch parts such as crown, Time Vision is seeking for greater perfection, every gear is ergonomic design, which brings better using experience. As we all know, the movement is the heart of watch, the stability of movement concerns the wearing life of your watch. 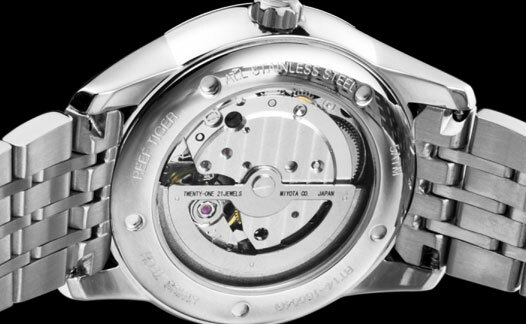 RT6203 movement, which is developed by Reef Tiger, has 21 jewels, the frequency of 21600 ensures daily error less than 5 seconds. 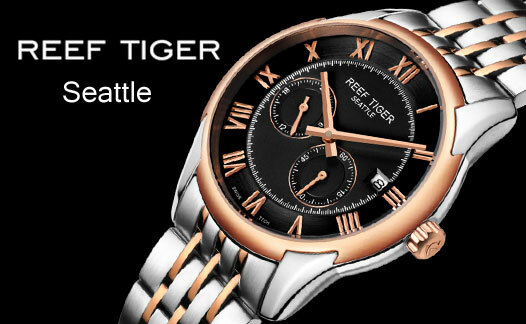 It is the core of Reef Tiger’s watch-making technology. Transparent sapphire crystal case back shows the operation of complicated movement, the working of each jewel and watch part is clearly viewed.